In this help document we will see how available delivery date and time are displayed in the Delivery Date Availability Calendar Widget using Custom Delivery Settings. 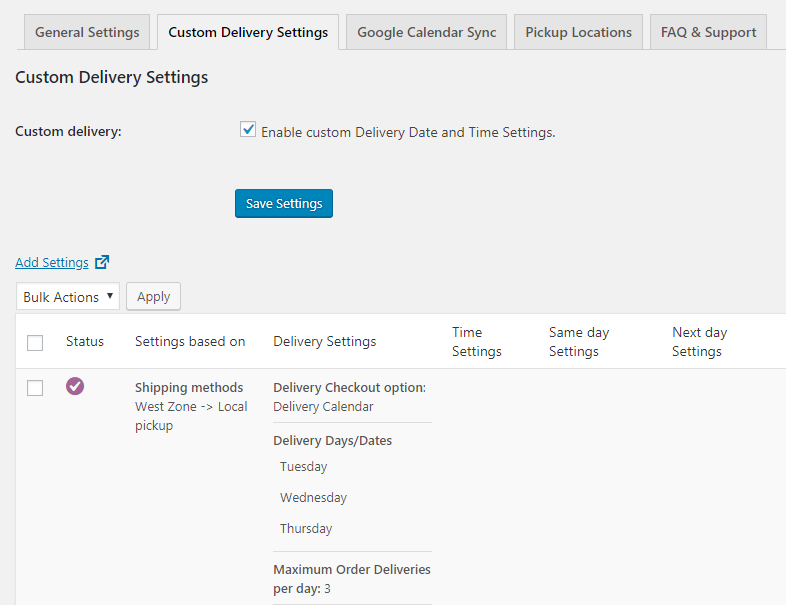 As per the settings added in Custom Delivery Settings tab, the delivery availability will be displayed on the frontend. The Custom Delivery settings will be displayed if the shipping method selected on the frontend by the customer appears first under WooCommerce -> Settings -> Shipping -> Shipping zones section. And the postcode added by the customer is present in the selected zone under WooCommerce -> Settings -> Shipping -> Shipping zones. If this is fulfilled, only then the Custom Delivery settings of selected shipping method will be displayed otherwise Global settings will appear. Let us consider an instance for better understanding of how this works with Date and Time Slot settings. This shows that delivery for West Zone – Local pickup shipping method takes place on all Tuesday, Wednesday and Thursday. Maximum Order Deliveries per day is set to 3. Now you need to add postcode for West Zone – Local pickup. So when customer enters the same postcode on frontend, Custom delivery settings of the selected shipping method will be displayed. 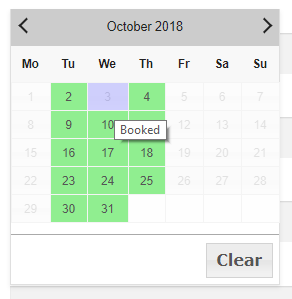 As you can see, the Delivery Date Availability Calendar is showing only Tuesday, Wednesday and Thursday dates available for delivery. This is because both the criteria for custom delivery settings were fulfilled. Considering the same product Packed Meal and same above custom delivery date settings, briefly let us see how this works for time slot settings. As you can see, the added time slots are 10:00 – 12:00 for Tuesday, Wednesday and Thursday with maximum of 2 order deliveries available per time slot. Here Tuesday, Wednesday and Thursday are enabled and on mouse hover, a message as Available Delivery Slots 10:00 – 12:00: 2 is displayed. This is because maximum of 2 order deliveries are available per time slot. There is a small functionality added for customer’s ease on Checkout page, which is auto-populating the customer’s entered postcode in the Postcode / Zip field of the Checkout page. This means when customer enters the postcode to view the availability of order deliveries on Delivery Date Availability Calendar widget, the postcode that the customer has entered will be auto-populated on the Checkout page, not having the customer to re-enter the same postcode. This document covers all the aspects related to Delivery Date Availability Calendar widget and how the added features in Custom Delivery Settings work. This plays a vital role in our Order Delivery Date Pro for WooCommerce plugin as it makes the most important process of displaying availability for order deliveries, swift and user-friendly.